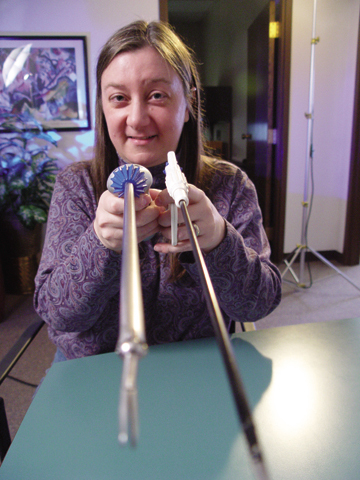 Susan Hallbeck, an associate professor of industrial engineering at UNL, points out the differences between new IntuitoolTM (left) and the old device used for laparoscopic surgery. The innovative surgical tool was designed by UNL and UNMC scientists. Photo by Dave Fitzgibbon. One of the problems with being an ergonomist is that one notices badly designed things and has an overwhelming urge to fix them. Blinders are not an option for Anthony Starace. John Gerard Ruggie, Kirkpatrick professor of international affairs and Weil director of the Center for Business and Government at Harvard University's Kennedy School of Government, will deliver the lecture "American Exceptionalism, Exemptionalism and Global Governance" at 3:30 p.m. April 7 at the Lied Center for Performing Arts. The University of Nebraska-Lincoln and Monsanto Co. have signed an exclusive licensing agreement to develop crops tolerant to the broadleaf herbicide dicamba. The UNL Libraries' Innovative Research Information System is quietly rolling into its 15th year as of April 1. The Mary Riepma Ross Media Arts Center will participate in the four-day, 11-title syndication of the 2005 Full Frame Documentary Film Festival. African cinema's founding father, 81-year-old Ousmane Sembene, continues to be its most fiery, provocative spirit as demonstrated by his most recent film, Moolaadé, opening at the Mary Riepma Ross Media Arts Center on April 1. Amy Goodman, internationally acclaimed journalist and host of the nationally broadcast daily radio/TV news hour "Democracy Now!," brings her "Un-Embed the Media!" national tour to the Mary Riepma Ross Media Arts Center at 7 p.m., April 9. The Sheldon Memorial Art Gallery is hosting Family Day from 1 p.m. to 4 p.m. April 3. The Lincoln Print Group will hold a print sale April 14-16 in Richards Hall Room 120A (conference room). Hours for the sale are 4 p.m. to 7 p.m. on April 14; 10 a.m. to 5 p.m. on April 15; and 10 a.m. to 2 p.m. on April 16. Minden is one of several sites around the state hosting a sneak preview of a new national documentary on the life of Nebraska writer Willa Cather produced by NET Television (formerly the Nebraska ETV Network). "Willa Cather - The Road is All" will be shown at 7 p.m. on April 9, at the Minden Opera House (322 East Fifth Street, Minden). Co-sponsored by the NET Foundation for Public Television and the Minden Exchange Bank and Trust, the event is free and open to the public. Get ready for whiffs, shoestring catches and fence busters in a battle for state bragging rights when the Nebraska Huskers travel to Omaha to take on the Creighton Bluejays at Rosenblatt Stadium in "Creighton Baseball," airing at 6:30 p.m. April 5 on NET1 and in high-definition on NET-HD.